It's really no secret that the World Series does not garner the interest it did in the past. Other than die-hard baseball fans, there was very little buzz (or even knowledge) of the Series among people. Jon Heyman was on The Score this morning talking about this. He said that the Series has become a hometown series where almost all of the interest is contained in the two cities represented. One thing he pointed out was that there are no day games any more during the World Series. Game IV last night started at 8:00 and ended around 11:00. It was a school night, so young kids could not fully enjoy the game. What do people think needs to be done to make the World Series relevant again? I remember growing up in the 60's and 70's and when the World Series was on, everyone tuned in regardless of the teams involved. It can't be that the Series competes with Football, because there has been NFL football in October for almost 100 years now. It can't be for lack of general interest because making the Series is Topic A for fans of almost all MLB teams from November until their team is eliminated in August/September the next year. I think day games on the weekends would go a long way. This would allow younger fans to get involved and more committed to the Series as they grow up. I also think the extended playoff schedule is a buzz kill. Right now, the only pro sport whose championship game garners widespread interest is the NFL with the Super Bowl. The NBA and NHL have extended playoffs with so many teams, they feel like regular season games. I think MLB has fallen into the same trap. With extended playoffs, the specialness of the World Series become anti-climatic because most casual fans have hit their saturation point. After all, once we're done with 162 games, there is a potential for another twenty games which is more than 10% of the regular season. Having two divisions where the division champs play a best of five to go to the World Series would keep post season interest high. Of course, the owners would never put the genie back in the bottle because it would reduce revenues in the short term until people rediscover baseball. MLB is partially to blame for this issue. When it's all Yankee-Red Sox, all the time regardless of whether or not you give a damn, it has an impact. When those teams don't get to the series a vast amount of the baseball fan base is rather ho-hum, who cares...."who are these Giants? Never heard of half the guys playing for Cincinnati" and so forth. MLB needs to start promoting and representing all teams, even garbage ones like Kansas City and Houston. If Fox doesn't like it (or ESPN) MLB needs to explain who is running the show. I understand the networks have a say in things given the money they are spending but you can't fall on your knees every single time they ask for something. Bob Grim has told me about the things the Sox have to do at times for ESPN when they televise a game and I've got to tell you, it's a wonder Bob and his people don't tell them to go **** themselves. What do you mean, Lip? Something in the way of having to brief the guys on all the players, coaches, what's been going on lately, etc? I think you have some very valid points here. Whenever you watch a national NFL show, especially on Sunday morning, you would be hard pressed to figure out which teams are the most popular nation-wide. They talk about each team in the same terms. The 1-6 teams get coverage as much as the 6-1 teams. This allows the casual fan (i.e., the one who does not spend many hours each week on football sites reading up on the players and teams and reading all the football publications that are out there) to easily get working knowledge of each team. Also by having numerous teams on MNF, there isn't that "Yankees/Red Sox again" feeling on Monday nght and each team gets at least one turn on Thursday night also helps spread out the knowledge. All teams west of New York/ Boston are required to provide GPS coordinates for their ballpark locations. This is absolutley huge and a major part if the issue, IMO. I don't think it's a reflection of the Series itself as much as a reflection of the state of the game. People aren't really interested in baseball as a whole--the fanbases are much more localized. Most people like to follow their own team, and when their team is eliminated they lose interest. It's not a huge, world-stopping event like the Super Bowl, and the players aren't marketed the way they are in the NBA--casual fans are less likely to tune in to watch Miguel Cabrera as opposed to Lebron James. Most fans who don't follow baseball religiously probably have no idea who Miguel Cabrera even is, or Matt Cain, etc. That's my theory, anyway. But as long as places like ESPN spend all of their time fixated on the Yankees/Red Sox, it will be hard for the casual fan to care about a matchup like Detroit/San Francisco. If you want the worlds series to be "relevant" like it was in the 60's and 70's, make only 5 channels available on TV, get rid of video games, the internet, cell phones, DVR, DVD's and computers. Also, the world series wasn't as popular as many think it was back then. Most world series games were day games. This is key. NFL markets all their teams, and so are not reliant on media darlings to make the playoffs relevant. MLB dropped the ball into the lap of ESPN, which has no interest in marketing 30 teams. The Fox postseason broadcasting team is a disaster. Most NFL regular season programming is on network television, but most MLB regular season programming is on local cable. It's easy for the casual fan to follow out-of-market NFL teams, but you have to get a package to follow out-of-market MLB teams. I have always thought that having any part of the playoffs on cable tv is bad for creating interest. The World Series should be the final act in the drama of the baseball championship tournament. However, you are asking a small but significant portion of the population to drop in at the end of the show after all the character development has taken place. Even within the group of cable holders, TBS is not a primary choice for those casually interested in sports. The early round games take an affirmative effort on the part of viewers to find which is an impediment to maximizing viewing. If I were MLB, I would be willing to take a little bit of hit in profits to get these games on CBS, NBC or ABC with Fox running a distant 4th and ESPN/MLBTV being used for complimentary coverage. I think part of the problem is that people now have more entertainment options at home. Before satellite/cable, most people were lucky to have a half dozen channels. Casual fans would watch the World Series just because it was on. Now, there are hundreds of channels, internet, dvr, on demand movies, etc. I'm not sure I've ever bought into this line of thinking. In the late 70s, baseball was all about the Dodgers and Yankees. In the mid 80s, it was the Cardinals and Mets. I think that particular problem, or at least the perception of the problem, has always existed. I wasn't alive in the '70s, so I can't say for sure. Maybe my memories of the '90s are clouded because I was still young. However, baseball coverage (ESPN) took a HUGE turn towards Yankees/Red Sox 24/7 around the turn of the century. In the '90s the Indians were a small market team which had huge national appeal. Of course, we haven't had a small market team come out and dominate a division while winning two pennants and having many superstar players since then, so there is no true comparison. I don't think those Indians would be hyped up as much in this day. Casual fans don't know stars unless they play for their team or a division rival. Who the hell is Joey Votto? Half of baseball fans today probably couldn't tell you because his great play is not highlighted. He's not exactly doing what Griffey did on a small-market Mariners team in the '90s, but he is still doing great in obscurity. Justin Verlander is the best pitcher in baseball, and on national commercials, but I would venture to bet the average casual Rockies or Padres fans couldn't pick him out of a lineup. ESPN spends the entire season telling us that the Yankees and Red Sox are the only teams which matter, then everybody is flummoxed when neither team makes it and the ratings are down. Another thing is, I think Fox has been terrible for the sport. Their coverage seems reluctant at best. "Well, here ya go. Baseball, I guess. Hey! In the stands there's a guy from one of our soon-to-be-cancelled sitcoms. Uhh, we will have football games on Sunday!" They went from trying to make a half-assed splash with KEWL robotic sounds and crap years ago, to now not even pretending to care. Hell, they don't even have baseball-specific theme music anymore. They use the "hard hitting" Fox NFL music, which is an awkward fit at best. Joe Buck is one of the worst announcers in sports, and he surely doesn't bring excitement to things. He said something along the lings of he doesn't consider baseball interesting, and it shows from his broadcasting. His disdain is apparent. It hate Fox's presentation of baseball. I don't think they have done anything to "grow" the sport. Put the playoffs on a different network. Have the announcers wear tuxedos just to show the world series is a BIG DEAL. Have advertising hyping up the World Series as a huge baseball event, not just part of "Foxtober! Big 12 football, NFL football, and then baseball at night!" Have the announcers wear tuxedos just to show the world series is a BIG DEAL. A lot of good points here, especially in the second paragraph. 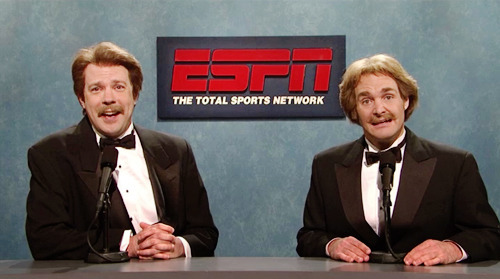 That Buck-McCarver announcing team is so horrible that I actually think I get stupider listening to them. There were at least five occasions during the World Series where I said either aloud or to myself, "What the hell are you talking about, McCarver?" Early in Game 4 during his "scouting report," McCarver suggested Matt Cain junk his slider because he had hung a few too many of them in his previous start against St. Louis. Ummm.... Ok, so let me get this straight: Cain, after using his slider as an out pitch against right-handed hitters all season, is supposed to just subtract that pitch from his repertoire in one of the biggest starts of his career. Yeah, that makes sense. Thanks for the insight, Tim. I'm sure Cain and Posey will take that suggestion into consideration. I think day games would be a bad idea, especially if you had an east coast and west coast team. I don't think you are going to see some mad rush of kids who watch. You have a lot of programming options, Kids can just play out the world series on their xbox whenever they want, its a long playoff stretch and gets deep into the heart of football season. So many reasons the games are down. This is an excellent point. I think you have the root of the problem in that ESPN is only interested in promoting the Red Sox (the Nation!) and the Yankees (the Empire!). Additionally Fox keeps treating baseball as though it were football and brands all their sports coverage the same which doesn't appreciate the differences in which the games are played and thus how they should be presented. 1. Interleague play. The World Series is no longer special, particularly when it can be a rematch of a series played during the regular season. 2. Expanded playoffs. Either the Division Series round or the fact that the League Championship Series is also seven games. Pick your poison. 3. Fox television. I'd rather listen to nails on a chalkboard than Buck and McCarver. I think it's sad that they can't play World Series baseball on a Saturday afternoon. MLB may be too scared to see that the SEC game of the week would have higher ratings.